Amidst the several other projects/goals I have set for myself this month and going forward into fall, I signed up to participate in an event taking place this week that will be a new experience for me. I am half excited, half nervous to be one of a number of artists painting the Great South Bay “en plein air“** for an event led by the South Bay Art Association aptly named, “Paint the Great South Bay.” Myself, along with other artists from around Long Island, will be setting up our easels to capture and create views of our island’s beautiful Great South Bay. Rain or shine (I hope to get out early to avoid the rain) we will be creating artwork on location this week from Thursday, the 20th, thru Saturday, the 22nd. I will use all the assorted social media outlets to post where I am, as well as document my progress. I plan to be setting myself up in Gardiners Park, right at the edge where I can grab both a view of the Fire Island lighthouse, the Robert Moses bridge, the *raincloud-less* sky, and of course the bay. On Sunday, August 23rd, from 1 pm to 4 pm, there will be an opening reception at the Paper Cup Studio art gallery (139 South Country Road in Bellport), displaying all of our work from the week. The pieces will be available for viewing and for sale from then until September 20th, with gallery hours being Thursdays to Saturdays from 11 am to 5 pm, and Sundays from 12 pm to 4 pm. There has been a Facebook group created for any one interested to check in and see where other artists will be located: Paint the Great South Bay FB Group. **en plein air: a French expression which means “in the open air” and is particularly used to describe the act of painting outdoors, which is also called peinture sur le motif (“painting of the object(s) or what the eye actually sees”) in French. For the month of November, eight of my paintings will be on display at Huntington's Book Revue. They will be displayed on their Featured Artist wall located in their Fiction corner (left most wall of the store upon entering) Advice of the day: go visit them, also there's a cafe, which means food. Samantha is a freelance artist, illustrator, author, and Long Island native. After obtaining her degree in illustration from the Fashion Institute in Manhattan, she has worked with a number of clients across the United States seeking to visually promote their businesses. Samantha has also self published a number of books both digitally (ebooks) and in paperback form. Two of her works,Illustrated & Alliterated: An Alphabet Book and #SamSketches: A Coloring Book are available in the children’s department of Book Revue. The paintings currently being shown are a conglomeration of her interests: design, nature, and her SamSketches brand and character. Over the years, she has been privately commissioned to create portraits, abstracts, or images that have been brought to her. This year marks her return to creating paintings of her own choosing, as well as it is her first year presenting such material to the public. Every month at Book Revue, we feature a local artist who we feel will interest or intrigue our customers. Please visit the artist’s work prominently featured in the Fiction corner of the store. All of the artwork on display is available for purchase. As much as I don't like my picture taken, I suppose I should mention I was in the news. But the moral of this blog post is that if you haven't gotten to go see the exhibit, you should soon. It's only open for another couple weeks. (Long Island, NY) The annual Arts Alive LI “Arts Month,” sponsored by the Long Island Arts Alliance (LIAA) and Bethpage Federal Credit Union is a month-long celebration of cultural events that take place across Long Island. Running through October 31, 2014, 40 remarkable venues will host over 100 events, including a special Hispanic Heritage Month Exhibition running through October 26 at Bloomingdale’s Furniture Gallery at the Roosevelt Field Mall. Sponsored by the Long Island Hispanic Chamber of Commerce and the LIAA, 12 Hispanic Long Island resident artists, will each have their artwork on display, many pieces for sale, throughout the gallery. 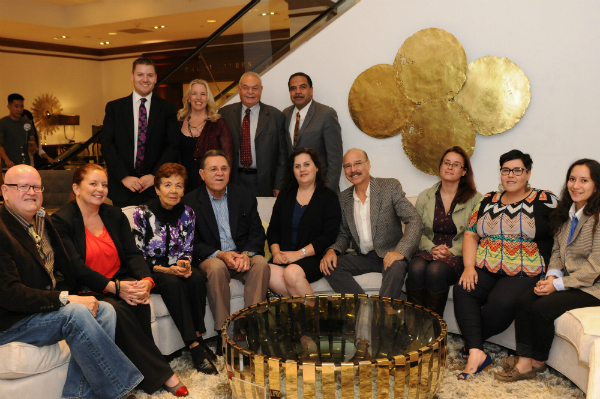 An artists’ reception to kick-off the exhibition recently took place at the Bloomingdale’s Furniture Gallery. Pictured (left to right) (top row): David Kirschenbaum, Manager of Public Relations, Bloomingdale’s; Theresa Statz-Smith, Executive Director, Long Island Arts Alliance; Luis Lopez, Immediate Past President of the Long Island Hispanic Chamber of Commerce; Louis Vasquez, President, Long Island Hispanic Chamber of Commerce. Pictured on the Bottom Row (left to right): Berges Alvarez, Anahi DeCaneo, Naomi Bonilla Diracles, Carlos Velez, Victoria Febrer, Freddie Lopez, Samantha Hernandez, Jessica Valentin, and Juliana Bedoya. Photo Credit: Arts Alive LI. 2014 continues to be the year of new experiences and checkpoints reached. I am going to be sad in a few months when it comes to a close, but excited for all the possibilities that 2015 will have in store for me. Most recently, I sent out an application via email with some jpegs attached and waited for a response to gain acceptance into what would be my first venture into hanging my art up on a wall (that was not my own) and have it proudly displayed for stranger upon stranger to view. If selected, my work would hang for just over a month, my name, photo, and bio, displayed alongside it for these strangers to learn a little bit more about me. After a period of time had passed, I began thinking I didn’t make the cut. Especially once I learned that only 10 – 15 artists were being selected for this exhibit. Perhaps it was self doubt, or me just being plain o’l antsy, but I decided it wasn’t happening and that was alright (as an artist you get used to silent rejection on basically a daily basis). Well, to my surprise an email response came the next day. The first sentence made me feel like I was being set up for a gracious let down, “Thank you for your recent submission…” the expected thank you for submitting your work statement — and then bam — “I am delighted to inform you that your work has been chosen to become part of this exhibition.” !!!! Yes. Frames were then quickly ordered, and very cost effectively acquired via Jerrysartarama.com . I tracked/stalked their delivery via online tracking (I love technology sometimes, I really truly do). The day they arrived I opened the giant box and began to frame my own paintings for the very first time in my life. This was a wondrous and beautiful endeavor, never before had I seen my work in such a polished and finished state. If you paint and have never framed a work of your own, I implore you — go out and do it. Then this past Thursday, I rode out to Garden City’s Roosevelt Field Mall to where the exhibit is set to take place — the Bloomingdale’s Furniture Gallery. There among other artists I was led through the different rooms (this place is a giant maze if you haven’t been there before) and given a few options on rooms to hang my work, as well as to hang it as I chose. Once I had made a selection — above a bed — I was given nails, hooks, and told I was free to hang. Half an hour later they were up. Thank goodness I happened to be carrying a hammer in my purse and had decent matching socks on my feet! Bloomingdale’s, Long Island Arts Alliance and the Long Island Hispanic Chamber of Commerce are pleased to present a collaborative art exhibition during September’s National Hispanic Heritage Month, a prelude to the celebration of Arts Alive LI – October Arts Month! Latin Americans come from over 20 countries and have a wide array of customs and rich and varied histories. That’s why celebrating Latino culture is a bit like eating tapas: you get to try a little sampling of everything. This exhibit is designed to celebrate Long Island’s rich Hispanic artistic heritage by presenting a sampling of works by artists of Hispanic descent specializing in several different artistic styles. On the off chance you don’t already have plans for the weekend, more specifically on Sunday anywhere from 11 am – 6 pm; you should most certainly without a doubt come by and visit your favorite sketching, blogging, paint throwing, illustration making, Bay Shore resident artist. <– And you should also try to say that whole sentence out loud too in one breath :) I will be set up somewhere along Main Street in Bay Shore among other artists, vendors, musicians, and possibly even live stock, the whole entire day. The weather is supposed to be beautiful. Which reminds me I should really invest in some sunscreen within the next couple of days. Oh and there will be food! Not sold on showing up, yet? Did I mention I’ll be there? Because really that should do it for ya. Bookmarks — free while supplies last! Okay, so I have been posting pictures pertaining to getting ready for a show for a while now. It may seem like a long while for some. But I have yet to give out all the technical info of it. For more info, in case you don’t like what I provided here’s the link! A super adorable coloring book by me! And oh yeah, just me in general. Standing there, at a table, waiting for you to visit me. Hey, I may even brush my hair for the occasion. But you won’t know unless you come see for yourself!